The Old Caledonian Bed & Breakfast and the Village of Caledonia are centrally located to many great attractions, parks, festivals, and events that the Bellevue Valley and other surrounding areas have to offer. Our lodging is just minutes away from the famous Mark Twain National Forest, as well as several other must-see parks and attractions. Just ask us if you need suggestions about some of the amazing activities our area has to offer. Here are just a few of the many places to go and things to see during your Missouri vacation. The Old Caledonian Bed & Breakfast is right on Caledonia’s main street, and is therefore seconds away from most of the shops, eateries, and events that the Village offers. Looking for lunch or dinner? We have several restaurants either across the street or nearby. Looking to do some shopping? Caledonia has many antique, craft, and specialty shops; including the Old Caledonian’s very own Amalgam Gallery of Art. Need a bottle of wine? We have a great wine and beer list,; in addition The Wine Cottage is right next door, and features wines, beer, and spirits right from Caledonia’s surrounding areas. Having a wedding reception? The Village Barn is accessible from our property. Elephant Rocks State Park, one of the most popular state parks in Missouri, is just a 15-minute drive from the Old Caledonian Bed & Breakfast! 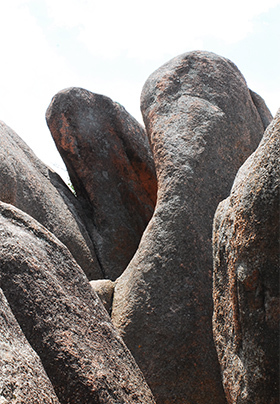 The park features enormous boulder and rock formations, swimming holes, and hiking. Johnson Shut-Ins State Park offers hiking, fishing, and swimming among giant rock formations – plus it features one of the state’s most famous swimming holes! 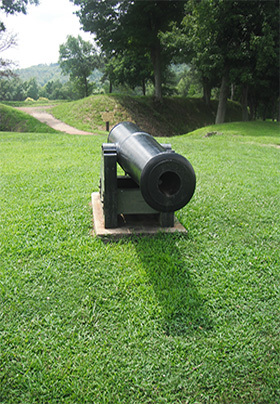 Fort Davidson State Historic Site, where the Civil War Battle of Pilot Knob was fought, is just a 20-minute drive from the Old Caledonian Bed & Breakfast. See history preserved at the grassy battlefield, the still-present earthworks, and the visitor’s center, which features artifacts from and a narrated story of the battle. The picturesque Dillard Mill State Historic Site features an original grist mill along the Huzzah River, plus opportunities for fishing, hiking, and picnicking. The trip from Caledonia is also a great motorcycle route! Washington County State Park is a great spot for fishing, swimming, and all levels of hiking. Missouri’s largest group of ancient Native-American petroglyphs is located here, as well as infrastructure featuring amazing stone craftsmanship by the members of Camp Thunderbird – an African-American company of the Civilian Conservation Corp, dating back to 1932. Missouri Mines State Historic Site features the imposing ruins of the local lead mine, as well a museum featuring information about what was once the largest industry in our area. Hughes Mountain State Natural Area, formed from ancient lava flows, Hughes Mountain is a geology enthusiast’s dream. It also offers some of the best views of our little section of the Ozarks. It is truly a local hidden gem, and is only 10 minutes away. And, of course, the famous Mark Twain National Forest has several of its Zone 4 (Potosi/Salem Ranger District) eastern and southern entrances nearby the Old Caledonian Bed & Breakfast, including one just 10 minutes away. Our area is a burgeoning wine region with over a dozen wineries within a 20-60-minute drive of the Old Caledonian Bed & Breakfast. Enjoy spectacular country scenes along your chosen wine-tasting route! From float trips to fishing to swimmin’ holes, our area has it all. There are several float trip companies nearby to help you make the most of your river adventures. We are happy to suggest places to fish, kayak, and swim during your stay. Just ask! Caledonia’s signature event is our annual Pumpkin Festival, which takes place the second Saturday in October, attracting thousands of visitors from across the state! A stay at the Old Caledonian Bed & Breakfast puts you right in the center of the action! Book early– we always sell out quickly! Caledonia also features an annual Chocolate Walk the Saturday before Thanksgiving! Discover Caledonia’s shops, eateries, and local businesses while sampling sweet chocolate goodies at each stop. The Old Caledonian Bed & Breakfast is a proud participant! Caledonia’s Vintage Market happens in the spring. It features vintage clothing, antiques, music, and food. Take a stroll around the market, which takes place in Caledonia’s famous Big Barn, and enjoy the Missouri spring weather while you shop! In nearby Arcadia Valley, the Mountain Music Festival happens each May and October. Featuring bluegrass style bands and solo performers, it is a great way to experience the culture of our area. In nearby Farmington, Country Days is a June festival featuring country music concerts, food, and wholesome fun. Book your stay early- most places fill up quickly! One of the more unusual festivals in our area is the annual Fête (pronounced “Fett”) in the small town of Old Mines, 15 minutes from the Old Caledonian Bed & Breakfast. The Fête, on the first Sunday in October, celebrates the French founders of that area, and features traditional music, food — even lessons in speaking the local French dialect called “Pawpaw”. Farmers’ markets and farm tours happen all the time in our area from spring to late summer. We would be happy to make some suggestions for you!